"My take on Aussie Bites™ with a little more added to them. Use a mix of chopped dried fruits such as raisins, dates, figs, cranberries, etc." 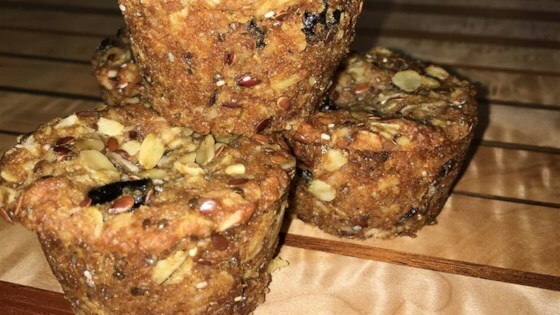 Mix whole wheat flour, oats, dried fruit, brown sugar, coconut, sunflower seeds, flaxseed meal, chia seeds, vanilla extract, and salt together in a large bowl. Melt butter and honey together in a microwave-safe glass or ceramic bowl in 30-second intervals, stirring after each interval, 1 to 2 minutes. Dissolve baking soda in hot water in a small bowl; add to the butter mixture and mix well. Pour butter mixture over flour mixture; mix well to combine. Spoon tablespoons of mixture into ungreased mini muffin pans and flatten tops slightly. Bake in the preheated oven until golden, about 10 minutes. Transfer to wire racks to cool. These chewy bites are so tasty, the kids won't know they're sugar-free. Turned out great, used 1/2 cup coconut oil ,1/4 cup butter and 1/4 cup applesauce for the 1 cup butter. Excellent! My household goes through a bag of these from the store in a day. I thought I'd try to make it myself, and I found that someone else already did. Thanks!!!! The bites I've purchased are wheat-free, so sadly, I won't be trying this recipe.